Not all hotels have swim-up pools, urban addresses and bustling lobby bars. Some are found in forests, others in caves and a special few present guests with the experience of a lifetime — you know, the stuff real memories are made from. Now, finding these hidden gems can be tricky. Even for the self-made travel agents out there, it’s unlikely that you will stumble upon any of these on Expedia. So, to make it easy for you, we curated a list of unique properties — each with their own brilliance and charm — but all likely unknown to the masses. Reason to visit: Where else can you hang with a giraffe? First up, Giraffe Manor in Kenya. Just southwest of Nairobi, this iconic building has been a part of the local landscape for nearly a century. 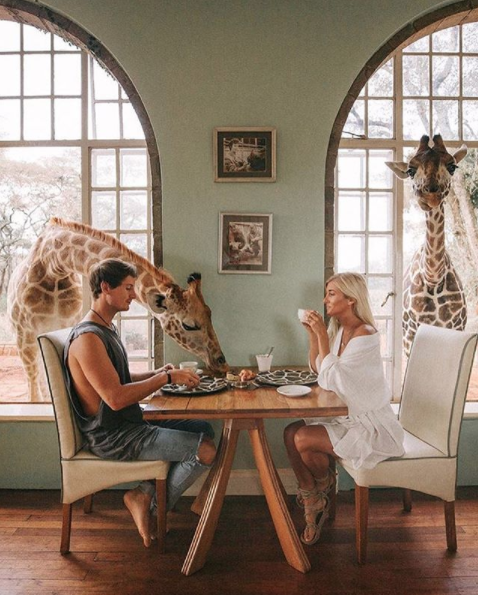 The sprawling property includes a 140-acre sanctuary for the resident Rothschild giraffes, who visit the Manor daily to greet guests and catch nibbles and treats. In the early ’70s, the home was purchased by Jock and Betty Leslie-Melville, a couple, who still use the Manor as their second home to this day. Much of their lives have been devoted to preserving the species that calls Giraffe Manor home. Safari packages start around $6,000. Reason to visit: Even Tarzan would be jealous. High up in the Pantagonian Andes, surrounded by forest and submersed in nature, is Nothofagus Hotel & Spa. A regional hub for eco-tourism, the hotel was built on a biological reserve, using recycled and locally-sourced materials. With a variety of different activities available within a stone’s throw of the hotel (and we aren’t talking about walking in the woods) this place is prime for any adventure seekers out there. Just make sure they tag their photos with #sirentravels so we can see them! Rooms start as low as $150 per night. Reason to visit: Far from life as a cave person. Plan a visit to Cappadocia around their balloon festival. If you cannot make it during that time, don’t stress — just make sure to crash at Cappadocia Cave Resort & Spa. Quite the opposite of how humans traditionally lived in caves, this luxurious resort offers Westerners the comfort of home, while in the confines of a mountain. If something like this sprung up in Alberta’s Badlands, would you be opposed? Suites here open at $223 per night. In a country where Gaudi reshaped conventional architecture long before the rest of the world started tinkering with normality, it is not surprising hotels like Hotel Marqués de Riscal exist. In fact, it is testament to the boldness of Spanish design. Hold on. Surprisingly, it was renowned Canadian architect Frank Gehry who was behind Riscal. It’s whimsical, curvy aesthetic gives way to crisp quarters and airy spaces with phenomenal sight lines. The perfect place to look down upon Spanish wine country. Rooms start at $435 per night. Reason to visit: Come on, gnome houses. Need we say more? Even though the hotel website only offers users French or Dutch (parlez-vous français?) as options, it is not hard to click around and instantly get sucked into the mystical hotel that is La Balade des Gnomes. Tucked away in the Belgian countryside, just a short drive from Liège, La Balade is a fantasy-lover’s dream. Be careful: do not wander too far off the property, we hear there are faeries in the woods. Rooms starting at $180 per night for two adults. Reason to visit: There’s not much like it anywhere on the continent. The only hotel in Canada that could hold a candle to Southern Ocean Lodge is Fogo Island. This is basically the southern carnation of it, at least. Call it Kangaroo Island edition. Arguably one of the most stunning and unique hotels in the world, book your stay through Mr & Mrs Smith and receive complimentary dinner for two in the wine cellar. Rooms start at $1,941 per night.